"With "The Verdict", Queensrÿche returns to a more progressive sound and shows itself inspired, not so far from its glory years." Queensrÿche's new career is a success. The aura of its glory years is no longer there, but the band has perfectly succeeded in reborn. He doesn't waste any time and release with "The Verdict" his fifteenth album. Since the last album, Scott Rockenfield, the historical drummer, has stepped back for family reasons. It is Todd who plays and finds the instrument of his beginnings. To See a founding member leaving may be worrying, but optimism is in order. Queensrÿche is in good shape and has regained liveliness with a direct heavy metal leaving the progressive influence aside. For "The Verdict" and with a renewed confidence, Michael Wilton has indicated that he wants to find this progressive sound again. The bet is bold but interesting, the band doesn't rest on its achievements and the idea of finding a sound close to the great albums is tempting. "The Verdict" switch from direct tracks with more adventurous to soffisticated tracks. Blood On The Levant' , 'Man The Machine' , 'Propaganda Fashion' and 'Inner Unrest' delivers a good energy. The Torre is still as stunning as ever and shines brightly. On guitars, Wilton and Lundgren built a precise duo that distills fast and melodic riffs and solos with a perfect technique. But what allows the album to rise are these more complex tracks wthat remind us of the past, somewhere between "Operation Mindcrime" and "Promised Land". In this perspective, Queensrÿche strikes several times with success. The trio formed by "Inside Out", "Bent" and "Launder The Conscience" are close to excellence. The band alternates atmospheres with class between catchy heavy , progressive flights and more aerial passages. There are also dark and melancholic aspects in 'Dark Reverie' and 'Portrait'. More calm, these songs lead the listener into a pretty emotional whirlwind. 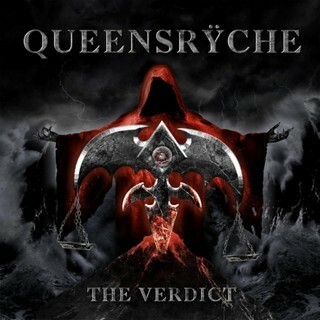 With "The Verdict", Queensrÿche regains a certain artistic ambition and success is guaranteed. It is pleasant to find out this strength both metallic and progressive and to find the band so much in shape.